This is the first of a three article series that will teach you how to efficiently detect collisions, generate contact information, and generate convex hulls for 3D objects. This article focuses on detecting the collisions via the Gilbert–Johnson–Keerthi (GJK) algorithm. Notice how in the second image A and B were intersecting and their Difference contained the origin? GJK exploits this by trying to build a simplex (tetrahedron) that encloses the origin using only points on the hull of the Minkowski Difference. One snag you will run into when generating support points is how to deal with a shape that has a rotation associated with it, the solution is to rotate the direction by the inverse of the objects rotation before generating the point, then you can just transform the point by the object’s transform matrix to rotate and translate it where it’s supposed to be. One thing to note, when a point is pushed to the simplex it is referred to as A, and the old points are pushed up, A->B, B->C, C->D. 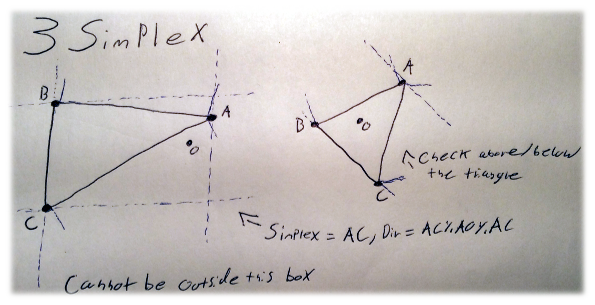 This allows us to use the order of the points in the simplex to our advantage later on. At this point the algorithm splits into one of three areas, depending on how many points are currently in the simplex. 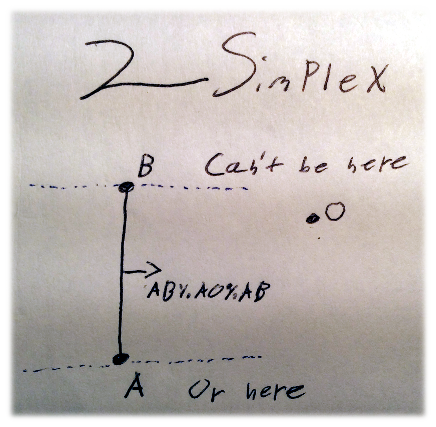 When there are only two points in the simplex we don’t have to test anything, just set the search direction to AB%AO%AB, which calculates the vector perpendicular to edge AB and parallel to AO. This is because we already know the origin cannot be behind point B, as we already calculated that A was in the direction of the origin. It cannot be in front of A because the early out (#4) would have failed. If we both of those fail we know the origin must lie inside the triangle. We must now determine whether it is above it or below it. To do this just check whether the dot product of the triangle’s normal and AO is positive. If it is the simplex remains unchanged, and the search direction is set to the triangle’s normal. Otherwise the origin is below the triangle, and we must rewind the simplex to reflect this. Just swap B and C. The search direction is in the face direction of the new triangle. This stage may seem like it should be more complicated, but in fact it is simpler than the triangle case. All we need to do is determine which face (ABC, ACD, ADB) if any the origin is in front of. 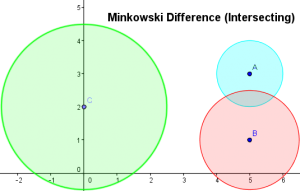 If it is in front of any of the three faces then the simplex is set to that triangle and is sent to a simplified version of the 3 point case. The simplification is that we know that the point is not below the triangle. If the origin is not in front of any of the three faces then we know we have successfully enclosed the origin and that we have an intersection! Clarity is important, so in my implementation I created a Simplex class that has methods for pushing a single point as well as overloaded methods for setting the whole simplex, set up such that it automatically keeps track of the simplex size. Now that we have a simplex that encloses the origin we can use it to calculate the contact data (contact point & normal and penetration depth) using the Expanding Polytope Algorithm (EPA), which I will be covering in my next article. The support map is very powerful, it can allow you to do awesome things like give your object a “collision skin” or sweep volumes over eachother (rod + sphere = capsule) (sphere + X = X w/ rounded corners :)) by just adding their support points togeter. You will likely need to add an iteration cap to your implementation to avoid nasty infinite loops. Hi. Thanks for a great GJK explanation. But I have a question. I really hope you can help me out. I want to know the distance between the two objects. I cant undertand how to terminate the loop? 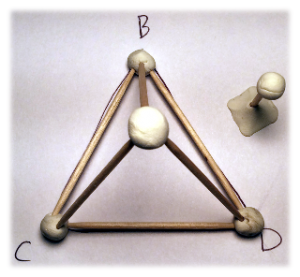 Because I want to stop searching for a new tetrahedron (4 points) when I have a triangle on the closest face. How can the algorithm stop with this triangle. This triangle (3 point) will be used as the final simplex. I guess I will have to do the same (3 point) check as above to check where on the triangle the origin lies. E.g. if it is closest to an edge I will compute the closest point on this edge to the origin. Then I will have the distance. 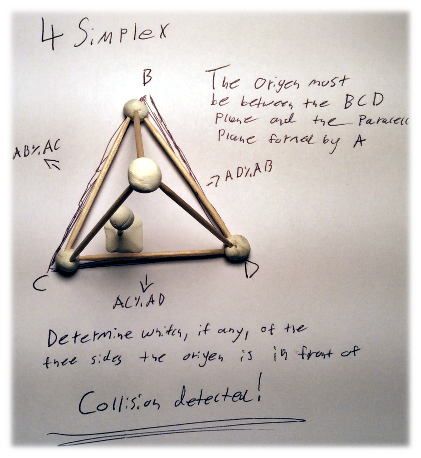 If origin is closest to the triangle face I will do a “Closest point – plane” test to find distance between origin and the triangle face. Hello Saadne. 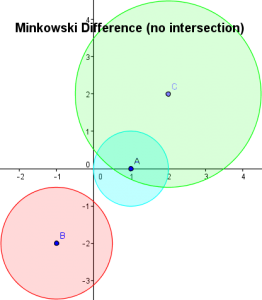 If I understand your question, you are only concerned with the distance between two convex objects? The GJK algorithm only works if the objects are intersecting, however, I have given this some thought, and I believe that you could skip the GJK and jump straight into EPA to get the information you are after. The main problem we are left with is the lack of a 4-point polytope. Since GJK cannot reliably generate one unless the objects are intersecting you need to come up with a new method of generating it. Perhaps by taking four support points, from four directions, say [0,1,0], [0,-0.707,0.707], [-0.577,-0.577,-0.577], and [0.577,-0.577,-0.577]. These should be the four most unique directions possible in 3 dimensions. The EPA implementation explained in the second article in this series should work, however it was designed with the assumption that the polytope it builds will always contain the origin. You will have to modify a couple of the checks to ensure that it is actually still finding the closest face to the origin. Thanks for trying to help me out here. I have another question. I would like to find the point (on the closest face of Minkowski Sum) closest to origin. The problem is that the point found might not be inside the face. It will be on the plane, but outside its face. So I will need a check whether the point found is inside or outside the face. This should be easy to figure out if I only knew the fourth (4) minkowski sum point on this face. (I can get a triangle on closest face from GJK). Since I am dealing with OBBs (find minimum distance between 2 OBBs in 3D) my minkowski sum shape will also be an OBB. So how can I find this last point for the current closest face? I get a triangle from GJK (3 points in minkowski sum) but I actually need all 4 points in order to know if the closest point found is actually inside the rectagle based face. I hope you understand my question and could give some help. Thanks! “the chosen initial direction is invalid, will produce (0,0,0) for a subsequent direction later”. Why is this ? Can you explain ? Jacob Tyndall's Blog is proudly powered by WordPress and Fidi Version 2.0™. 23 queries executed on 1.050 second.